AIG’s Marilyn Blattner-Hoyle, Head of Supply Chain and Trade Finance, and Sharon Giddings, Head of UK Trade Credit, discuss how recent geopolitics are driving the need for well-thought-out trade credit and finance insurance products. Growing protectionism and a rapid escalation in trade disputes involving the world’s biggest economies are creating ripples across the world, threatening trade flows and the businesses that rely on them for survival. 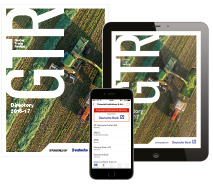 In unsettling times, banks and corporates need more than ever an insurer they can rely on to provide a degree of certainty in an uncertain world. 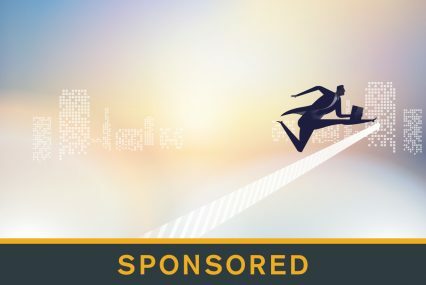 AIG prides itself on building true partnerships with clients, founded on trust, and on a long-standing culture of avoiding knee-jerk decisions. This unique approach also includes helping clients navigate challenges as they arise with innovative solutions only available at AIG. One product that not only comes into its own ahead of a downturn, but demonstrates AIG’s special commitment to clients, is trade credit insurance. For example, AIG’s excess of loss trade credit insurance is designed to ensure a company can offer credit to its buyer clients with confidence. It is an important tool that allows companies to protect their accounts receivable from loss due to credit risks such as protracted default, insolvency and bankruptcy – and which helps keep trade flowing throughout the economic cycle. The value of trade credit insurance has been amply demonstrated worldwide. In the UK alone, a recent string of corporate collapses has contributed to the highest number of trade credit insurance payouts in a single quarter since at least 2007, when the Association of British Insurers (ABI) started collecting this data. During the second quarter of 2018, trade credit insurers paid £92mn to help British firms cope with bad debts. For the right client, AIG is prepared to go one step further, adding an extra layer of safety through the provision of non-cancellable trade credit coverage across the whole client portfolio. This involves a commitment by the insurer to maintain credit coverage for future shipments to buyers on a client’s policy, even if the buyer posts poor operating results or is suddenly downgraded. Coverage also remains intact when a country or entire industry sector hits bad times. As well as protecting trade flows, this provides certainty to policy holders that once a credit limit is established it will remain in place for a specific time – usually the duration of the policy – unless the insured requests otherwise. Policy holders are also able to stand by their customers during difficult periods, meaning their customer base is more likely to remain intact – and their own sales recover quickly – once the business environment recovers. “With credit limits in place that stand the test of time, policy holders can negotiate and invest in long-term relationships with their customers,” says Sharon Giddings, Head of UK Trade Credit at AIG. AIG is able to extend non-cancellable cover to customers that can demonstrate they are well positioned to trade safely through a downturn due to robust risk and credit management. The product is therefore available mostly for bigger companies that already have sophisticated risk and credit management strategiesin place or mid-sized companies thatare willing to centralise their treasury systems and invest in online platforms to strengthen those capabilities. In return, policy holders are given more autonomy and discretion in how they implement that strategy, only being required, for example, to provide AIG with guidance on their customers once a year, when a policy is put in place or renewed. In contrast, holders of cancellable or whole turnover policies effectively rely on their insurer to take control of their credit management. Regulatory change – especially when the final shape of demands remains unclear – can create a further layer of complexity for corporates and banks looking to navigate an already turbulent world. Here too, insurers like AIG can help. 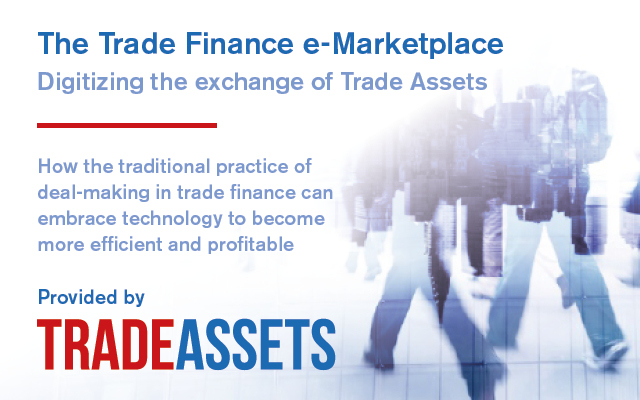 As demand for trade finance grows, financial institutions are increasingly tapping credit insurance to protect themselves against the risk of non-payment by obligors for trade finance transactions. In a Basel III world, however, there is often now a mismatch between banks’ insurance needs and those of their seller or exporter clients. Fortunately, AIG has developed a tool that can help bridge the divide. Basel III – a global regulatory framework for banks designed to address capital adequacy, stress testing and market liquidity risk – creates a challenge globally for banks looking to buy receivables from a specific buyer of their seller or exporter client. This is because where the same receivables have been insured under the seller client’s standard trade credit insurance policy, there is typically a high degree of conditionality that relies on the seller. The bank therefore often cannot get the capital relief it needs by just relying on a loss payee position on the standard trade credit policy of the seller client. Banks do have the option of taking out a Basel III-compliant trade finance insurance policy, which by shifting the risk of corporate default onto the often higher-credit-rated insurer could hand the bank capital relief while remaining compliant with the rules. This would however require the payment of additional premium. To help smooth the process and reduce costs for both sides, AIG has created a tool that allows the seller client to keep their existing credit policy on their buyers, but provide the bank with their own Basel III-compliant wording on their own standard form or on AIG’s simple trade finance Basel III-compliant form, and which then seamlessly links the two. It does this via an endorsement in the middle called the “TC Bridge”. This solution allows for the sharing of limits, while giving the bank control in respect of relevant obligors up to the size of their facility. It also enables the two sides to share the costs of a single premium, albeit with a slight uptick to allow for the benefit of Basel III limited conditionality. 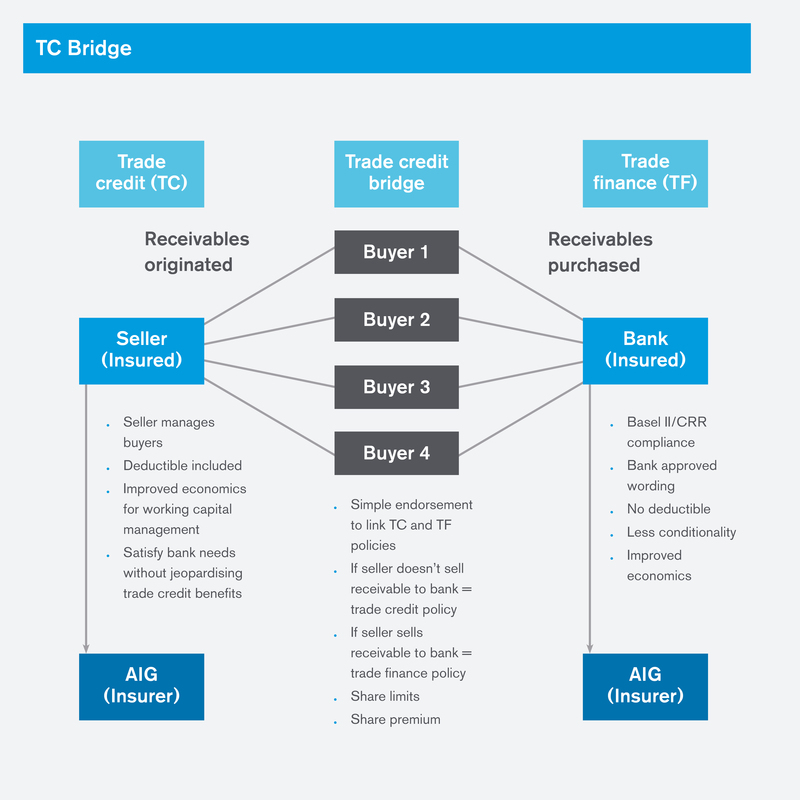 Non-cancellable trade credit cover and the TC Bridge are of course just parts of AIG’s tool box, which includes a broad suite of products related to trade finance and trade credit. AIG’s expertise in trade credit insurance also extends to excess of loss coverage for bigger firms as well as the Trade + and AR Secure products for mid-sized companies. 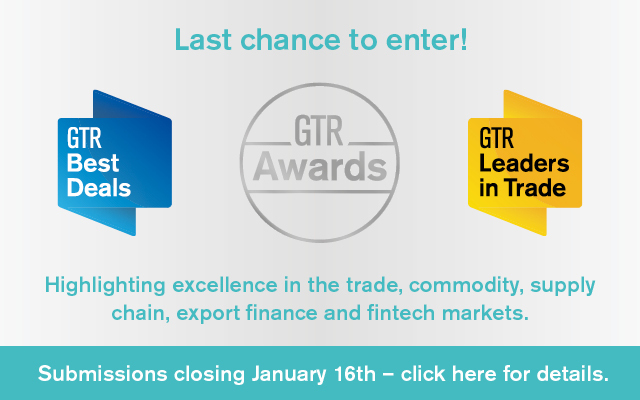 AIG brings a team of trade finance experts from the worlds of banking and insurance to create simple, market-leading solutions to support growth in trade finance. Its trade finance credit insurance can protect financial institutions offering everything from receivables finance and payables finance to trade loans, letters of credit and asset-backed lending as well as other short-term and self-liquidating trade facilities. AIG is also a lead insurer in API and blockchain-based solutions and can support both funders and corporates that use various technologies, leading to potential cost savings, better payment terms and streamlined working capital solutions. We welcome enquiries about how we can tailor solutions to meet clients’ requirements, leveraging our wealth of market intelligence, country knowledge, sector specialists, experienced underwriters and A+ rating. 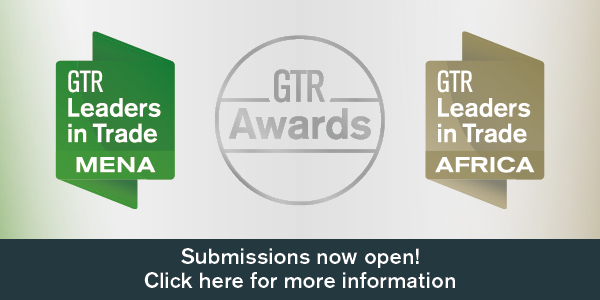 Please contact Marilyn Blattner-Hoyle and the AIG Trade Finance team at marilyn.blattner-hoyle@aig.com for more information on the TC Bridge and other trade finance solutions, or Sharon Giddings and the Trade Credit team at sharon.giddings@aig.com for AIG’s trade credit products.